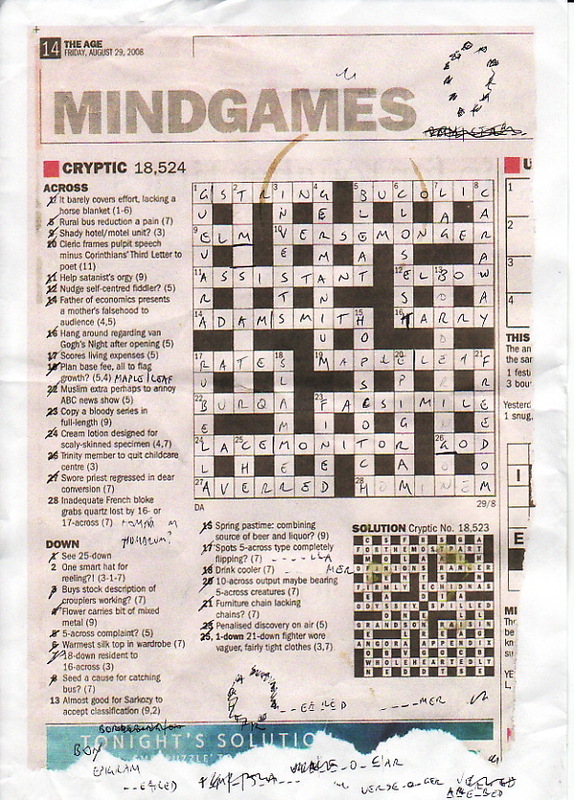 10 across: Cleric frames pulpit speech minus Corinthians’ Third Letter to poet (11). The answer makes sense in the context of the indirect clue: cleric = VERGER, pulpit speech = SERMON, minus Corinthians’ Third Letter (R) = VERSEMONGER; but has anyone *ever* seen a poet referred to as a “versemonger” before?? 2 down: One smart hat for reeling? (3-1-7). I have no idea about this at all. The only thing I can think of is that it’s some sort of term for a fishing reel, with which I am not familiar. Ideas? 13 down: Almost good for Sarkozy to accept classification (9, 2). Also bewildered by this. The only thing I can think of is BORDERING ON, which works for “almost” as the direct clue… But where does Sarkozy come into it? The BO could be “almost good for Sarkozy” (ie. “bon” – French for good – minus the “n”, meaning it’s “almost good)… but then where’s the direct clue? Anyway, a decent effort – here’s hoping our spiritual leader AS will be back on deck next week. Muslim extra perhaps to annoy ABC news show (5). You are correct, TH. The answer is BURQA. I got this but I still don’t get it, if you catch my drift. Yeah, I thought it had to be. To annoy = BUR, ABC news show = QA (Q&A perhaps), Muslim extra = BURQA. I guess. Here, good for Sarkozy = bon, classification = ordering so that almost = bordering on = good for Sarkozy to accept classification. Thanks. That makes sense. An online dictionary gives a definition of “bur” as “a persistently clinging or nettlesome person or thing” which sounds pretty annoying. 2 down is “TAM O’SHANTER”. It was the only thing I could think of that fitted so I put it in. I knew a reel is some kind of Scottish or Irish dance & I knew Tam O’Shanter was something or other Scottish or Irish. Apparently it is a kind of Scottish hat. 13 down: The direct clue is: almost (=bordering on). Good for Sarkozy = bon (French for good). “To accept” is a containment indicator. Classification = ordering. 28A: The solution is HOMONYM. The direct clue is 16- or 17-across (TARRY or RATES), since these are words that when written have more than one meaning. French bloke = homme. Inadequate French bloke = homm. Grabs is the containment indicator. Quartz = onyx. By = x (the multiplication symbol, as in 2 by 4 = 8). So quartz lost by = ONY.